The folks at McCalls continue to make good on their mission to provide inspiring and beautiful patterns for the cosplay community. This release rounds out the three-pattern Worbla saga that is Becka Noel’s Calista Night (M2116). All sizes are included in one envelope. The inspiring and beautiful Becka (https://www.facebook.com/OfficialBeckaNoel/) graces the cover of all three of her Calista Knight packets, so you can be sure that this costume, made from unconventional materials, looks exactly as the designer intended for your reference photo. You will find the extremities covered in this packet: Shin guards (greaves), bracers (forearm), hand armor (a little fingerless glove-like cover), and wrist armor (like a big bangle bracelet). All are no-sew because it’s Worbla and foam. The pattern lists alternative techniques, but centers on the one layer of Worbla over foam method. As with the previous 2 packets (Calista Knight I (M2114), Calista Knight II (M2115) the pieces are formed over craft foam (EVA foam). The packets show you how to cut the foam, form the Worbla, adhere the Worbla to an EVA foam backing, set “jewels,” finish, and paint your Worbla armor. These are the best tutorials that I have seen on Worbla, and they travel easily in a nice neat packet, with no tedious re-watching of videos. Once you finish these pieces, you should be able to easily tackle larger and more complicated projects. 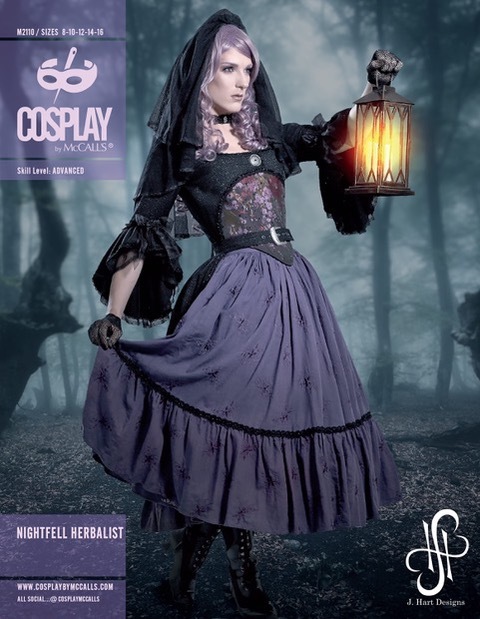 J Hart Designs’ (https://www.facebook.com/JoshuaHartDesign/) Nightfell Herbalist (M 2110), sizes 8-24, is a sweet take on an 1780’s robe à l’anglaise—complete with the dropped shoulder seam. That’s the beautiful and inspiring Joshua on the cover of the packet rocking the look. Note that this is not a separate robe and bodice. These are sewn as one, with a zipper up the center back. It’s the perfect place to use that scrap of unbelievably expensive brocade you found and have been desperately hanging on to, even though you knew it was not even enough for a corset. Sure, it could be a stomacher, but this is so much more fun. So why, you may ask, does that look so much like a corset and not just a dress bodice? Ah Grashopper, the corset front is heavily boned, so it will look fantastic and not rumpled. Never forget that boning’s job is to keep seams and garments from rumpling up vertically. It’s boning that keeps a garment smooth and properly shaped. The boning here continues on the side backs of the “jacket” so that the finished look is smooth all around and looks like the corset front is actually a corset with a jacket over it. Bonus: The jacket is lined, so that whole high/low look is not spoiled with unsightly seam allowances and thread floats. The skirt is a very straightforward 3-fabric-widths-gathered-t0-waistband model with ruffle at the bottom. However, it conceals a built-in tulle petticoat. Sewing with tulle can quickly prove spontaneous generation is real when it is present in sufficient quantities. It consumes all available space in your sewing room—and more. You might say that I am exaggerating, until you work with it yourself, but I digress. For this part, I would consider adding up all the widths needed for the petticoat and just cut it all-in-one on the cross without seams. Warp and weft are not an issue with tulle. Do the same with the ruffles. The seams do help one organize all that tulle by being a “roadmap” for evenly arranging gathers. You can mark those missing seam lines at the top and bottom of the petticoat with safety pins and use those was your roadmap instead. I only suggest this because I am all for deleting seams where possible, but that is just my preference. Your milage may vary. This is a lovely, thoughtful pattern. Joshua has included all the details, right down to hanging loops at the shoulders. Save a bit of your fabric to make the self belt that is shown in the picture. There is no pattern piece or instructions for it, but you can use a belt that fits you as a pattern. Twice the width of your sample belt, plus seam allowance. Sew right sides together, leaving one short end open, turn, and press. Be sure to use heavy interfacing or belt backing. Add a purchased buckle and grommets. Voila.